Nokia's entry level QWERTY handset Asha 201 is now available online. The deal site Snapdeal.com is offering it for Rs. 3,990. Nokia Asha 201 is a single SIM variant of the previously launched Nokia Asha 200. This device offers a 2-4-inch TFT screen and 1430 mAh battery. It runs on Symbian operating system. There is a 2-megapixel rear camera on board and it can support external storage up to 32 GB via a microSD card. It will be available in three colour options - black (graphite), white and pink. However, for now only graphite version is on sale on the site. The Finnish handset maker had showcased Nokia Asha 200 and Nokia Asha 300 at Nokia World in 2011 and launched in India in December 2011. 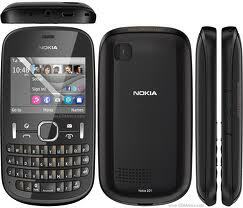 Nokia Asha 200 is a dual-SIM dual-standby handset and has the same features as the Nokia Asha 201. It is currently available at the street price of Rs. 4,020. Nokia Asha 201 is available in five colour options - Graphite, White, Pink, Blue and Green. Just last month, Nokia had introduced two new Nokia Asha devices in India, the dual-SIM Nokia Asha 308 and the full touch Nokia Asha 309. The Asha 308 is a 2G-enabled handset sporting a 3-inch WQVGA capacitive display with multiple home screens, 1110mAh battery and 64MB internal storage with up to 32GB microSD card support. It is available for Rs. 5,685. Nokia Asha 309 is the single SIM variant of Asha 308.